DentalTree (Implants - Cosmetics - Lasers) is a Prosthodontics Clinic in Aundh, Pune. The clinic is visited by prosthodontist like Dr. Ganesh and Dr. Athira. 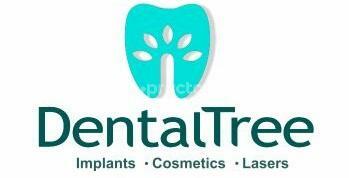 The timings of DentalTree (Implants - Cosmetics - Lasers) are: Mon-Sun: 09:00-22:00. Some of the services provided by the Clinic are: BPS Dentures Fixing,Retention implant dentures,Restoration Aesthetics,Ceramic Crowns and Bridges Fixing and Mouth Guard etc. Click on map to find directions to reach DentalTree (Implants - Cosmetics - Lasers). I had met with an accident and had fallen on my face with front teeth fractured. The nearest clinic which I could go was of Dr Athira... she was really good and treated me more like a friend than a patient. Her hand for dental procedures is too good... I did not get any swelling which otherwise I see people getting for root canal treatment or so...nor was there any pain during n after the procedure. She was really too good...friendly...understanding. I would always recommend her name if u want to do any dental procedure. Visited dental tree for implants. I was highly impressed with the cleanliness of the clinic. The clinic is well equipped with state of the art technology. **** ******* *** *** *** ****** ********* **** ********* ** ****** ******** Really want to thanks the doctor for the treatment with no swollen face or gums. Also you have a well equipped dental Clinic. I appreciate your kindness. Thanks a lot.